Engel and Wolf's brewery and vaults, Philadelphia, PA. circa 1855. 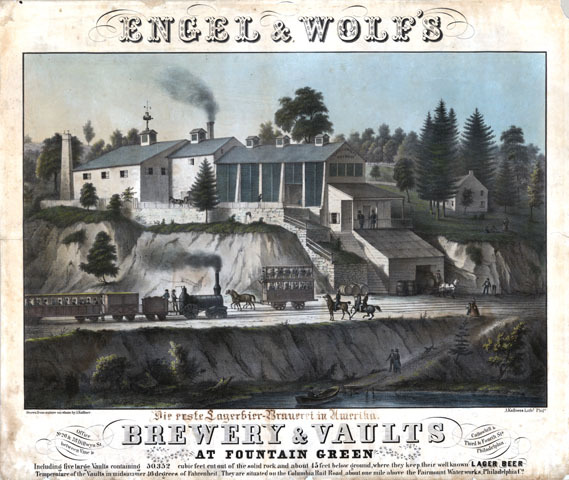 Located in the Fountain Green section of Philadelphia, the Engel and Wolf's brewery included five large vaults cut out of the solid rock about 45 feet below ground that help their beer at a constant 40 degrees of Fahrenheit. The brewery was situated on the Columbia Rail Road, about a mile above the Fairmount Waterworks.